At Mark Anchor Albert and Associates, we have over 85 years of trial experience in federal and state courts, administrative proceedings, and arbitrations. 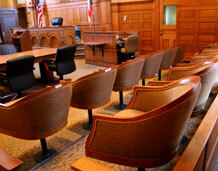 Our Los Angeles business litigation lawyers can protect the interests of your entity. We are also knowledgeable in real estate and construction litigation, Chapter 11 bankruptcy litigation, insurance coverage disputes, securities fraud, and professional negligence. These cases have resulted in repeated victories in state and federal courts, and arbitration proceedings, saving or recovering amounts totaling in the billions of dollars for our clients. Business disputes may arise whether you have an LLC, a partnership, or a corporation. Generally, the documents that the parties used to form the business, such as partnership or shareholder agreements, bylaws, or voting agreements, include terms that govern the relationships among the parties. California corporate and partnership laws may also govern which actions may be taken. When these intra-business disputes arise among partners, shareholders, or other owners, the business' operations may be significantly disrupted. In some cases, for example, a minority shareholder claims oppression by majority shareholders. Oppression can include terminating a minority owner's employment, distributing too much of the profits to majority owners as compensation, or refusing to provide financial information about the company to the minority owners. In California, there is no specific cause of action for the oppression of minority shareholders in close corporations. However, any shareholder in a close corporation can petition the court for the involuntary dissolution of the corporation when a controlling interest has engaged in persistent, pervasive mismanagement, abuse of authority, fraud, or misapplication or waste of property. When a corporation has 35 shareholders or fewer, and at least one-third of the outstanding shares want a dissolution, a corporation can be dissolved if liquidation is reasonably necessary to protect the complaining shareholders' interests or rights under California Corporations Code § 1800(b)(5). The protection of intellectual property, including copyrights, patents, and trademarks, is also crucial to the success of a business. When appropriate, we can bring an infringement lawsuit or defend against a lawsuit on a business' behalf. Under 17 U.S. Code section 501, a legal or beneficial owner of an exclusive right under a copyright is entitled to take action against an infringement of that right that is committed during the period of ownership. Remedies for copyright infringement under 17 U.S. Code Chapter 5 may include injunctions, disposing of any infringing items, damages and profits, and costs and attorneys' fees. We have successfully handled many different types of real estate and construction claims, including delay claims, breach of contract cases, change order disputes, bond and lien issues, non-performance, and construction and design defects. In more complex construction litigation, all of these issues may be present, and there may be numerous parties potentially at fault. Often substantial discovery, expert site visits, and multiple mediations are necessary in order to make sure that the appropriate party is held responsible. It is common for insurance coverage disputes with insurers to arise in construction litigation. As experienced insurance litigation attorneys, we can also ensure that any bad faith on the part of insurers is appropriately addressed. Our firm handles litigation related to Chapter 11, including coverage issues under E&O, D&O, and CGL insurance. Among other substantive issues, we have handled lender liability, fraudulent conveyance actions, preferential transfer actions, debtor-in-possession financings, corporate governance claims, attorney fee challenges, debtor securities violations, officer and director negligence and malfeasance, relief from automatic stays, subordination actions, dischargeability challenges, and claim objections. Businesses pay premiums for multiple types of insurance in order to protect themselves against various threats, including the threat of litigation. Unfortunately, insurance companies do not always provide the protection that was contractually promised. They may deny valid claims or pay less than what your claim is worth, and it may be necessary to file first- or third-party claims against them. Insurers are required to use good faith toward their policyholders. In California, bad faith exists whenever an insurer acts unreasonably in failing to abide by its obligations. In California, Insurance Code section 790.03 lists unfair and deceptive insurance practices. A first-party insurer is considered to act unreasonably or without proper cause if it fails to fully, fairly, and thoroughly investigate all bases of a claim. When investigating a claim, the insurer owes an obligation to diligently search for and consider any evidence that supports coverage of a claimed loss. An insurer's bad-faith actions may include failing to make a good-faith effort to settle claims, failing to respond promptly with regard to a claim, misrepresenting policy provisions to claimants, unreasonably denying benefits, or failing to make an adequate settlement offer in litigation, thereby forcing the policyholder to litigate the claim. Damages in a bad-faith action may include the benefits due under the policy plus interest, consequential economic damages, emotional distress, and attorneys' fees. If an insurer acts with fraud, oppression, or malice, it may be possible to recover punitive damages as well. We handle investment advisor, broker-dealer, and finance-related claims, including those involving statutory violations, breaches of fiduciary duties, sales practice disputes, churning and unauthorized trading, stock manipulation, fraud, negligence, investment unsuitability, and failures to supervise. Often, both federal and state laws govern a particular securities issue. For example, claims for fraud may be covered by federal laws, California statutes, and the common law. 17 CFR § 240.10b-5 prohibits the use of any means or instrumentality of interstate commerce to employ any scheme, artifice, or device to defraud, as well as to make untrue statements of material facts or omit material facts in a misleading way, or to engage in any course of action that operates as a fraud or deceit upon someone. Under California Corporations Code section 25401, communications about securities sales that include a misleading material omission or untrue factual statement are illegal. Engineers, financial professionals, and lawyers are held to a higher standard of care than laypeople. In California, for example, a lawyer is negligent if he or she does not use the care or skill that a reasonably competent lawyer would have used in the same or similar circumstances and thereby causes actual damages to the plaintiff. A jury may need to determine the level of skill that a reasonably careful lawyer would have used in a similar situation. Expert witness testimony establishes the standard of care and can be critical to the outcome of a professional negligence case. In cases involving negligence by a professional engineer, for example, the plaintiff's lawyer will need to include an affidavit stating that he or she has consulted with at least one licensed person in the same discipline as the defendant and, based on that consultation, believes the suit is meritorious. A failure to comply with this requirement can result in a dismissal. At Mark Anchor Albert and Associates, our Los Angeles business litigation attorneys can help you develop and pursue a course of action that furthers your interests. Mr. Albert has been rated as a "Super Lawyer" in complex business litigation. Our firm represents clients in North Hollywood, Beverly Hills, Burbank, Glendale, Pasadena, Long Beach, Santa Monica, and Pomona, as well as cities throughout Orange, Sacramento, San Diego, Santa Barbara, and Santa Clara Counties. Contact us at 213-699-1355 or via our online form to set up an appointment with a business litigation, insurance, professional negligence, real estate, bankruptcy, or securities law attorney.